Please your loved one immensely on this Valentine's Day with a combo of roses and a cute teddy. Afterall, who wouldn't love to be pampered with such adorable gift combos! 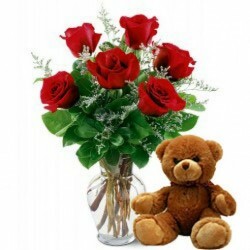 Send Valentine's Day Roses with Teddy from MyFlowerTree and make your loved one's day an enduring one. 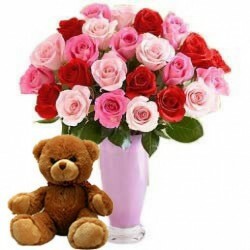 Valentine’s Day Roses With Teddy Bear: Love More, Cuddle More! All a girl needs on Valentine’s Day is flowers, a tight hug, and some cuddles. To ensure the same, MyFlowerTree presents its exclusive range of Valentines Day Roses With Teddy Bear that will be the saviour for every man this February 14th. Needless to say that flowers are always a hit on Valentine’s Day. They are something that are loved by every girl. 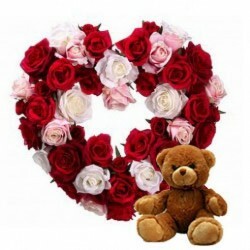 But, if you think that a bouquet of flowers is not enough to convey your love for your special woman then, you can go with our Valentine flowers with Teddy bear that are sure to make your girlfriend happy. 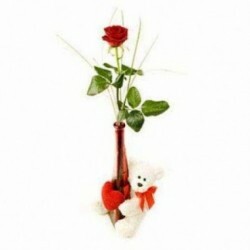 Why Should You Gift Valentines Day Roses with Teddy? 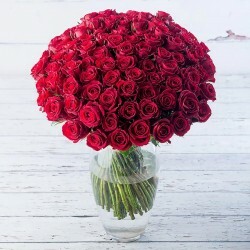 First of all, if you are looking for something cute and simple that can help you say ‘I love you’ to your beloved in an effortless way, then, you cannot find a better gift than Valentines Days roses with a Teddy. 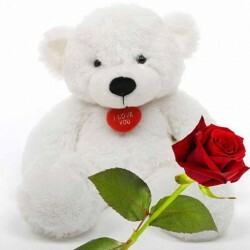 Secondly, while flowers can make your beloved smile in a minute, a teddy bear will always your beloved remind of you. 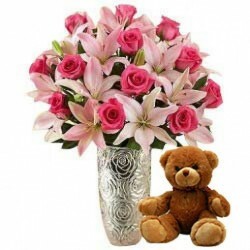 Thirdly, while flowers can convey your love for your beloved, a teddy bear will never let your beloved feel alone. We have the best and softest quality of roses, and Teddy bears respectively. We have beautiful rose arrangements that come in a rainbow of colours like red, pink, white, orange, yellow etc. Coming to our collection cuddly Teddy bears, they are of the best quality. 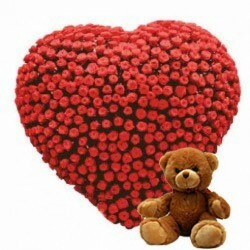 So, order Valentine roses with a teddy bear from us and make your Valentine’s Day happier. Want to send the cuddliest and happiest Valentine gift for your lover who stays miles away from you? If yes, then browse through our wide collection of Valentine flowers with Teddy bears exclusively launched to make your Valentine’s Day a little more romantic than others. Make Valentine’s Day a memorable one by surprising your partner with our Valentine flowers along with a teddy bear. Plan a Valentine surprise for your beloved and send Valentine flowers with teddy bear online with our gift delivery services across India. We deliver flowers, cakes, and gifts in more than 350+ Indian cities and abroad as well. Therefore, if your lover stays in Australia or USA or Uk or UAE or Canada then, you can rely on us to send a Valentine surprise online for him or her just in a few clicks. Products in this category have been rated 4.7 out of 5 based on 114 reviews.